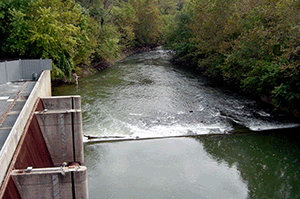 Working to ensure continued superior water quality for public health protection, the Washington Suburban Sanitary Commission (WSSC) is conducting a feasibility study of a submerged Potomac River intake for water supply to the Potomac Water Filtration Plant (WFP). The Potomac WFP produces approximately three-quarters of the water used by 1.8 million customers in Montgomery and Prince George’s Counties. WSSC is not seeking increased water withdrawals from the river, but is seeking higher quality source water from an alternate location. Previous studies recommend and support this evaluation of an alternate intake location. 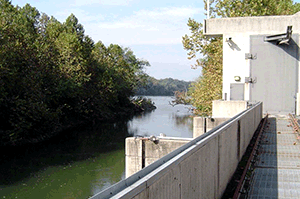 The current Potomac River raw water intake structure is adversely impacted by its location along the Potomac River shoreline. During local storm events, sediments in runoff from local tributary inflows – particularly from nearby Watts Branch - cause the source water quality to change dramatically and affect the water treatment plant operation. Water quality is cleaner and more stable in the middle of the Potomac River than at the intake along the shoreline during local storm events. The submerged intake would draw higher quality water from the middle of the river during these times. This phase of the feasibility study will examine possible locations of the intake and connections to the existing plant, evaluating construction methods, environmental and community impacts, and costs. 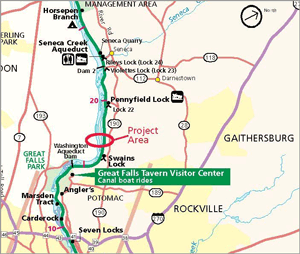 Some components of the Potomac WFP are located in the Chesapeake and Ohio Canal Historical Park, managed by the National Park Service (NPS). The NPS is re-initiating an Environmental Assessment process including public involvement and review that will factor into the evaluation of feasibility. WSSC commits to open communication and regular updates during the feasibility study and subsequent activities. The feasibility study began in 2003. Environmental and technical data were collected, a public informational workshop was conducted, and a draft Environmental Assessment of developed alternatives was prepared for preliminary review by cooperating agencies. However, in 2006 the finalization of the environmental assessment was deferred and the study was subsequently expanded to consider operational information from other mid-river intakes that was not previously available. WSSC formally re-initiated revision and finalization of the feasibility study in March 2013. Following study completion WSSC will seek concurrence of County Councils on recommendations of the feasibility study.